Gothic Instruments have been wasting no time in adding to their list of sound modules for Dronar. At the time of writing, the release of Metal & Glass represents the eighth module within the series. 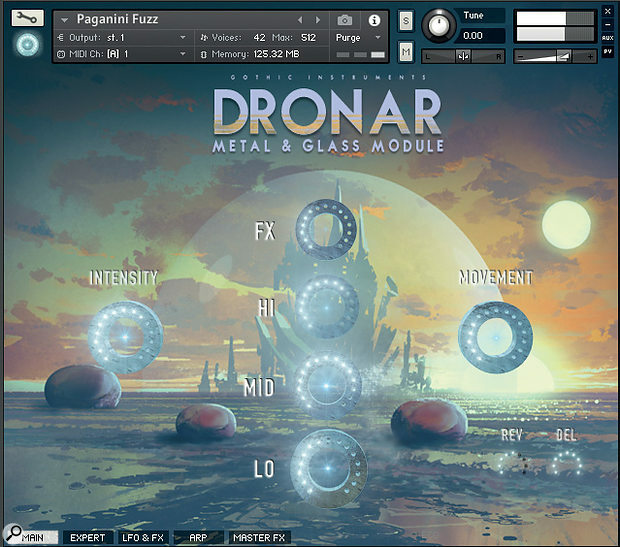 The Dronar front end is, itself, a Kontakt-based instrument while each module offers a different, themed, sample base. This allows the user to build a custom suite of sounds by selecting from the various low-cost modules. The Metal & Glass module is built around some 4.5GB of sample material and, given the title, it is perhaps no surprise that the sampling involved a lot of metal and glass objects. As with other modules in the series, these sounds are mostly transformed into playable pads and drones but, given the features of the excellent front end, amongst the impressive number of presets, there are also sounds that offer more melodic options including bass, arps and pulse-like sounds. As ever with a drone/pad library, the titles of the presets are pretty subjective (just what does a Fountain Of Stars sound like? ), but the broad categories that the presets are organised into — dark, dreamlike, horror, inspirational, danger, etc — are helpful. The Dronar engine remains the same; each preset in Vintage Synth is therefore based upon blending four underlying sound elements labelled low, mid, high and FX, each of which can also be a blend of two of the underlying raw samples. The Easy screen provides simple blending of the four sound elements while the Expert, LFO/FX, Arp and Master FX pages provide much more detailed control. In short, there are plenty of sound design options for those that want to go beyond the presets. The prime target for this (and the other) Dronar modules is media composers. Indeed, for those composers looking to find sounds outside the more conventional orchestral palette, this kind of drone/pad library provides a great alternative in which sustained strings (for example) can easily be replaced (or complimented) by some other-worldly sounds. Metal & Glass does dark, sinister and unsettling very well. However, in addition, there are also some more uplifting and dreamlike sounds amongst the preset collection as well as some very usable bass, arp and ‘pulse’ sounds. If you invest the time to master the Dronar control set, there is a lot of mileage to be had from any of the available modules. Each is also very reasonably priced with further discounts available for additional modules to existing Dronar users. Yes, Dronar is primarily a drone and pad instrument — although it can do more — but it is a well-designed and flexible option for media composers on a more modest budget.